Since I finished the dissertation, I’ve been reading chunks of Karl Barth. In Volume I, Part 2 of his 13-part Church Dogmatics, he writes at length of the subjective side of revelation, what might be called the “appropriation” of the objective side of revelation, what Christ has accomplished for us (§16). How does it look, what happens when people get involved with what Christ has done for them? Barth’s answer is simple: the Holy Spirit. And because the Holy Spirit makes us share in what Christ has done, and not something else, this sharing has a definite form: Church, sacraments, Scripture, and preaching (I/2, 249) under the “mastery” of Christ (265ff.). Barth is making a polemic here against various certainties we might have. We cannot claim that an experience, a feeling, a decision guarantees our right standing before God–though these things may be signs of it. Sure. But I’m more interested in the way that Barth says God’s revelation claims all of us, the whole person: all our thought, feeling, emotion, attitude, habit, memory and desires. This means, though I’m not sure if Barth says this himself, that our salvation reforms all the pieces of who we are. But I wonder if saying this means we cannot also say, as would a Kierkegaard or a Blondel, that the will or action plays a central role in our relationship to God in a way that, say, memory does not. Our relation to God certainly does not exclude these other areas, but might there not be a kind of tiered relation, where the will or desire plays a key role? I’m finally reading the famous commentary on Romans. Of course, there are all the sharpened descriptions of contradiction between God and humanity, stunning and blunt: “In the Resurrection the new world of the Holy Spirit touches the old world of the flesh, but touches it as a tangent touches a circle, that is, without touching it” (30). “But the activity of the community is related to the Gospel only in so far as it is no more than a crater formed by the explosion of a shell and seeks to be no more than a void in which the Gospel reveals itself” (36). “Precisely because the ‘No’ of God is all-embracing, it is also His ‘Yes’” (38). What is most striking just now, having spent last week with him, is how much I feel like I’m reading a biblical commentary written by Kierkegaard. Barth quotes him on the very first page, and throughout you can almost touch the Dane, he’s so palpably present. 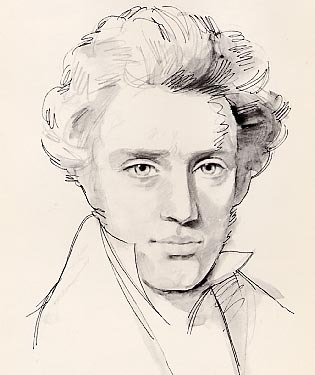 His ideas are ubiquitous: the “Paradox” (29); “contradiction” (38); “seriousness” and the demand for “choice” (39); God in “incognito” (39); the “qualitative distinction between God and man” (39); the impossibility of “direct communion” (50); and more than any other, the absolute difference between “time and eternity” (29, 44, 47), which is the presupposition of Barth’s whole text. I’m curious how much Kierkegaard’s influence will appear through the rest of the commentary, both explicit and not so subtly hidden. In this light, it makes sense to see Paul speaking of the battle with the spiritual powers and authorities, the need for spiritual armour, the struggle with the sinful nature so central to his life (esp. Romans 7), and the bitter clashes with his opponents in the churches. From John, however, we are presented with a picture of calm repose, even at those moments in his gospel which in the others are full of agony. On the cross, Jesus’ life ends not with the dramatic cry as in Mark’s gospel (15:34), but with the composed, “It is finished” (19:30). Now, this difference should not be overplayed, but it is striking. Striking especially in light of the historical circumstances that generated the Reformation. A certain monk, Martin Luther, of the Augustinian order—Augustine’s theology being strongly influenced by Paul—was greatly troubled over his sinfulness and lack of assurance. Luther was continuously plagued by Anfechtung, or “tempting attacks.” Only in reading the first chapter of Romans, with its teaching of justification by faith, did he find himself totally carried away, relieved, transported to a place of comfort and solace. The same sort of pattern is seen in Kierkegaard, perhaps the paradigmatic Protestant, who spoke similarly of Anfægtelse, or “spiritual trials.” (See the excellent article, “The Lightning and the Earthquake,” by Podmore.) This bloomed in Barth’s early dialectical theology of Krisis where Kierkegaard’s “infinite qualitative distance” between God and humanity is unfolded in all its purity. This genealogy—Paul, Augustine, Luther, Kierkegaard, Barth—suggests a highly significant set of questions, again in light of von Balthasar’s earlier distinction between Pauline and Johannine types of Christian experience or spiritualities: Would the Reformation have occurred if Luther had been formed in a Johannine spirituality of eternal rest? If Luther had been, say, a Benedictine or Franciscan rather than an Augustinian monk? Would it have taken another avenue, perhaps waiting the 20 years for Calvin to begin it? Would it have ended with the Catholics and Reformers so violently opposed? Perhaps most interesting to me, and ecumenically significant: Can the history of the last 500 years between Protestants and Catholics be helpfully read as a history of spirituality? And will this reading allow us to come back to one another once again? The alleged freedom from presuppositions of which a certain [knowledge] is accustomed to boast, simply means that yet another presupposition is being made. Concretely this means that God’s revelation is not to be reckoned with, that on the contrary it is possible to adopt a neutral attitude to what this Scripture points to, just as it is possible to take up this attitude to other things. This neutrality, this unconcern about God’s revelation, and therefore this “freedom from presuppositions” is a presupposition exactly like any other. But since it is a matter of division in the Church, we can recognise these divisions only with horror and can only pray for their removal. We verily believe in the one Church. We can see here nothing but an affliction of the Church, which we must believe will be overcome, though in truth the power to overcome it is not in our hands. “Orthodoxy” means agreement with the Fathers and the Councils. As that it can never be an end in itself … If only they knew definitely that here, too, there is a binding tie, they might be disposed to let this “tie” to the Church’s past remain in force as after all a quite respectable affair. The more one listens and breaks free from the illusion that the world began with oneself, the more will one discover that these Fathers knew something, and that the scorned “orthodox” writers of, say, the seventeenth century were theologians of stature. And it can even happen that alongside of them modern theological literature will be found a little insipid and a little tedious.